The award-winning Hampton Inn - Suites Madison/Downtown is in the heart of downtown Madison WI. 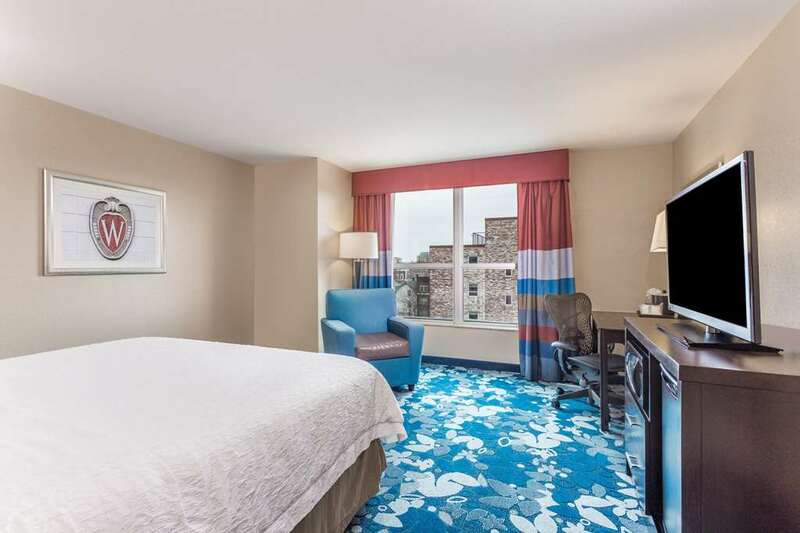 Just a short walk from shops restaurants sporting venues convention centers and nightlife all downtown Madison attractions can be easily reached. The hotel offers a free hot breakfast free WiFi free fitness center indoor swimming pool and whirlpool integrated parking ramp and an on-site restaurant. Enjoy a great night*s sleep on the Clean and Fresh Hampton bed and guest room amenities including microwave refrigerator and ergonomic desk. If you*re not satisfied we don*t expect you to pay that*s our 100 Hampton Guarantee. Bassett Street Brunch Club: Playful versions of comfort food breakfast classics and cocktails in a modern atmosphere...and donuts lots of donuts. Dotty Dumpling*s Dowry: Convenient to campus and the Kohl Center. Burgers malts and homemade soups. The Old Fashioned: Upscale Wisconsin tavern a contradiction in term. Enjoy our favorites in a civilized throwback.